I was the luckiest kid in the world when we went on family camping trips. When everyone else in the campground would be eating burgers and corn on the cob night after night, my dad would cook these gourmet meals whose enticing aromas would make any passerby envious of the feast we were preparing. Going on camping and backpacking trips, particularly in northern New England, is probably one of the things I am most thankful to my parents for doing when we were young. These experiences probably did more to define who I am today than just about any other experience I had growing up. It helped teach me to learn how to take care of myself, how to have faith in myself, have courage, stamina, teamwork, and to learn to appreciate the beauty in all things around me. There is an exhileration and euphoria that you feel when you finally reach a summit and look at the beauty of the vast expanse of sky and landscape all around you – and all of a sudden your sore legs and the effort of the strenuous climb are all more than worth it. Some meals became regular camping traditions — so much so that we would all look forward to those meals just because we were camping. One such meal was beef stroganoff. Yep, my dad made beef stroganoff when we went camping, all on a simple 2-burner propane stove. It was a regular dinner item and totally awesome after an intense day of hiking around in the White Mountains (our most common destination). Here’s a picture of us (I’m the 14 year old in the back with the terrible hair in the height of my teenage “I don’t like my picture taken” phase, haha) from one summer trip – note my sister, always the ballerina haha. Actually I have no idea what she is doing in this pic, lol. And so I bring a little piece of those memories to you, in this family recipe of beef stroganoff. Granted I hadn’t met my husband yet so my family knew nothing about being gluten free then, but the modification is pretty easy – just use gluten free pasta and some GF flour. That’s it. This post is also a part of the “Go Ahead Honey, It’s Gluten Free” series, hosted this month by Shirley of Gluten Free Easily. And perfectly appropriate for the summer, the theme is “Make me a happy camper“! 1. Trim and tenderize steak. Cut into bite size pieces and toss in a bag with flour, salt and pepper. 2. You will need to do this next step in batches. Heat up a pan and melt 1 tbs. of butter at a time and brown the meat, then transfer to a plate. 3. Once all the meat is cooked and transferred to a plate, add more butter to the pan if needed and saute the onion and mushrooms. Add the meat back to the pan and red wine and keep heat down to a simmer. If you didn’t happen to bring wine with you camping, you can substitute water here. 4. Mix water, bullion and flour together and then add in to the pan. Add in the tomato paste, and let simmer for about 30 minutes. Stir occasionally to make sure nothing sticks to the bottom. 5. Remove from heat and stir in sour cream. Ok so plating totally doesn’t look this awesome when camping. But today I am not camping, and so decided to garnish with some sour cream & fresh tarragon. Funny how strongly we associate certain foods with memories of our childhood. Whenever I eat beef stroganoff, I think back to all of our awesome family adventures. I’ve starred two or three stroganoff recipes in the last week or so. Something about it just sounds so good (my mom used to make it all the time when we were kids). Mine will just be mushrooms to make it vegetarian, but conceptually it reminds me of childhood, too. What a sweet post. Its amazing how a certain dish can bring back so many memories. This looks delicious. This looks great! And I love the memories that go along with it! Great story. 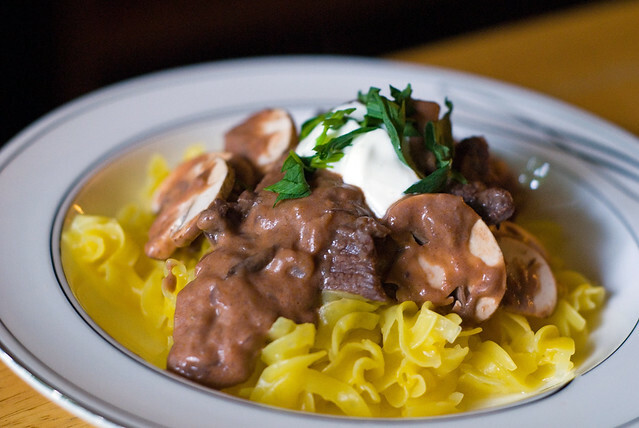 I love beef stroganoff, but have yet to find a recipe I really liked. Am looking forward to trying this! Family camping trips are one of my favorite childhood memories too…but now that I have a husband who doesn’t camp, I have to be satisfied with just day hikes. I love beef stroganoff but haven’t made it in a while. Thanks for the inspiration. Yours looks beautiful! Jenn, this looks like it came out great! Thank you for the wonderful memories and the lovely tribute. I am so glad that our trips made such an impression on you and I hope that they will continue to influence you as the two of you start to create your own traditions and memories. – I always add a dash or two of worcestershire sauce with the sour cream. I don’t have a bottle in front of me, but suspect that it is not GF friendly and that’s why you left it out. But if GF isn’t an issue for some of your readers, then I suggest trying it as part of the unique flavor of this recipe. As it is for you, this recipe is also part of my childhood memories. I’m visiting my parents this week, and we had beef stroganoff the same night you made yours! What a terrific post, Jenn! Love the memories shared and your dad’s recipe. 😉 I hope our son will look back on all our camping adventures the same way. We’ve been taking him since he was in diapers, seriously. We just got back from our New England motorcycle trip … 11 days, 2100 miles, many states, one moose photographed, etc. … and we went through White Mountains three times I think (VT, NH, and ME). Which ones did you guys hike and camp in? I would have never espected beef stroganoff while camping. What great memories and a sweet post.